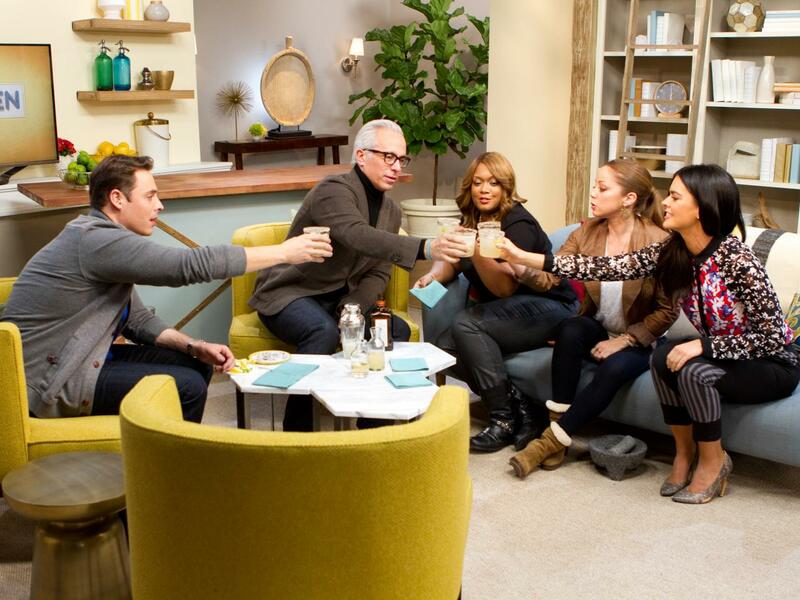 Just a few months ago, five of your favorite Food Network chefs came together on The Kitchen to celebrate what is arguably the most-important room in the home. 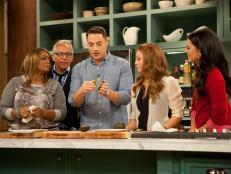 Now after a premiere season jam-packed with an over-the-top snackadium, special guest chefs, Tool Takedowns and one unforgettable Double Provolone, Geoffrey, Jeff, Katie, Marcela and Sunny are gearing up for a second round of go-to recipes for eats and drinks, timesaving cooking strategies and kid-friendly meal solutions. FN Dish was on the set of The Kitchen recently and we caught up with the group as they looked back on their most-memorable moments from early episodes and revealed what's to come in new episodes, beginning this Saturday at 11a|10c. For many of the co-hosts, the top unforgettable moment was when Jeff donned a sandwich-themed bodysuit to perform an impromptu routine he called The Double Provolone for Brian Boitano. "I mean, I saw it on the monitor 'cause I wasn't actually in that segment, but I was crying I was laughing so hard," Marcela admitted. Jeff and Katie, too, recounted that scene, Jeff deeming it "very risky" and Katie saying simply, "That was special." 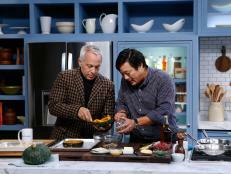 While it's no secret that the co-hosts enjoy food, Sunny divulged an on-set detail that fans might not have realized: "Many times the food that is made is supposed to be saved for beauties, but the natural reaction of all of us five hosts is to dive into a plate as soon as the camera cuts. So sometimes we're fighting over what we get to eat and what we can't eat," she explained of what goes on behind the scenes. When asked which of his Season 1 recipes viewers should make first, Jeff said, "I think they should definitely make my tofu and eggplant stir-fry. It's crunchy, it's sweet, it's spicy, it is so easy to do and so delicious." 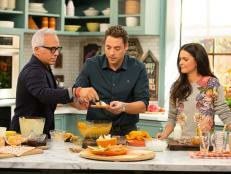 Katie was asked the same question, and she revealed that she's become a fan of some of her co-hosts' dishes. She called Geoffrey's pesto-topped salmon "a go-to at my house now," and said, "Marcela made a kale, Brussels sprout and quinoa salad that I've probably made about a dozen times. I like to have it on hand in my refrigerator at all times." 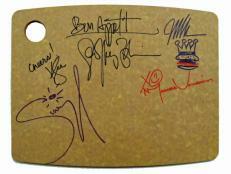 Sunny joked that when it comes to the second season's cast, fans should expect a subtle change. "Well, we had a cast change. 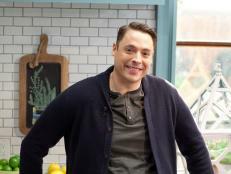 The kindergarten school asked for Jeff Mauro to come back, and so we had to send him back. So we have Jeff's stunt double, a slightly more mature [guy]," she kidded, adding later, "But we're going to have a really good time. We've got more of Tool Takedown [and] we've got more viewer submissions of questions." 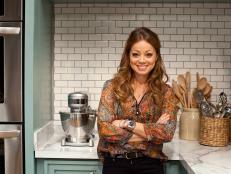 For Marcela, new episodes will showcase the best of what this dynamic group has to offer. "Season 2 is about how we've become a family and how we've become such close friends," she explained. "It really is like having a family or a really tight group of friends just sit down, talk about food and share their experiences. So I think more than anything, I'm the most excited about the camaraderie that's happening on Season 2." 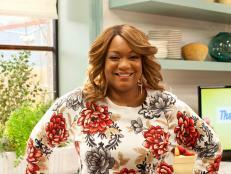 Tune in to the Season 2 premiere of The Kitchen on Saturday, April 19 at 11a|10c. 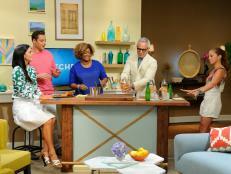 Quiz: How Well Do You Know the Co-Hosts of The Kitchen? Test your knowledge of the cast of Food Network's The Kitchen by answering 10 trivia questions, and see if you deserve the title of superfan. 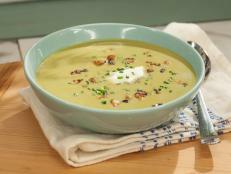 Vote in the poll to tell Food Network's The Kitchen how you enjoy soup and what you'd need to make your soup recipes better.